More than two dozen figures from the world of arts and entertainment have called on the Prime Minister to protect the BBC from cuts to its service. 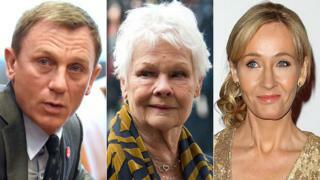 Bond stars Daniel Craig and Dame Judi Dench are among the 29 signatories of an open letter calling for "a strong BBC at the centre of British life". "A diminished BBC would simply mean a diminished Britain," the letter reads. It comes ahead of a government green paper that is expected to call for a narrower range of BBC programming. JK Rowling, Stephen Fry and screenwriter Richard Curtis have also put their name to the letter, which expresses a "concern that nothing should be done to diminish the BBC or turn it into a narrowly focused market-failure broadcaster". "The BBC is a very precious institution," the letter continues. "Like all organisations, it has its faults but it is overwhelmingly a creative force for good. "Britain's creative economy is growing and enjoying unprecedented success. The BBC is at the heart of this as the global showcase for our creative industries. "The BBC is trusted and loved at home by British audiences and is the envy of the world abroad." Other signatories include Clare Balding, Chris Evans, Gary Lineker and Graham Norton, believed to be among the BBC's most highly-paid broadcasters. Details of celebrity salaries were contained within the BBC annual report launched on Tuesday, which revealed that the money spent on the corporation's star presenters rose from £194.2m in 2013/14 to £208.4m in 2014/15. Other signatories include Sir David Attenborough, Melvyn Bragg, DJ Nick Grimshaw, the newly knighted Lenny Henry and Strictly Come Dancing host Claudia Winkleman. The full text of the letter, delivered to Downing Street on Tuesday, can be read on the Daily Telegraph's website. Culture secretary John Whittingdale is expected to set out a range of proposed reforms in his green paper on Thursday, among them the scrapping of popular shows like The Voice and the replacement of the licence fee with a household tax. He has appointed eight people to work on the renewal of the BBC's royal charter - which sets out the corporation's remit - including Dawn Airey, former boss of Channel 5; journalism professor Stewart Purvis, a former editor-in-chief of ITN; and Dame Colette Bowe, former chairwoman of Ofcom. The panel was criticised by conservative peer Lord Fowler, who warned in the House of Lords on Tuesday that the BBC was "under unprecedented attack". "I must warn those who support the BBC that we have something of a fight on our hands," he said. "The cards are marked and somewhat stacked against us. The advisory group advising the Secretary of State clanks with special interests and past opinions." Speaking at the same debate, Lord Patten, a former chairman of the BBC Trust, called the government's advisory panel "a team of assistant gravediggers" who would help the culture secretary "bury the BBC that we love". Baroness Neville-Rolfe, government spokesperson for the Department of Culture, Media and Sport, responded by saying "no-one is seriously proposing the BBC's abolition". However, she warned, "one particular area of contention" was the "extent to which the BBC manages to meet its impartiality obligations, and how best this should be achieved and regulated. "As we near the end of the current charter, we are also presented with the opportunity, through the charter review, to consider in full the BBC's activities, its appropriate scale and scope, and how it should deliver." Tony Hall, the BBC's director general, made his own case for the corporation on Tuesday, saying "a BBC that doesn't inform, educate and entertain is not the BBC the public know and love". Lord Hall cited such dramas as Wolf Hall, The Missing and Poldark as examples of BBC successes over the last 12 months and said it would be "hard to support" proposals that stopped it making popular entertainment programmes. Similar sentiments have been expressed by shadow culture secretary Chris Bryant, who said the "golden thread" running through the BBC was that "it provides something for everyone."